Campground Owners: Showcase your campground directly on Google Street View. You probably have a lot of people asking if you have more pictures of your campground. Wouldn't it be great if you could give them a better idea of how you are laid out and what your property has to offer BEFORE they come to visit? Introducing Google Campground Views! It's a Virtual tour of your campground published directly to Google Maps! 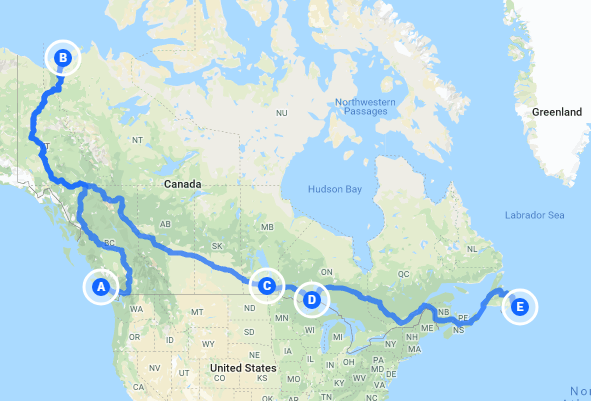 This summer we are embarking on an epic trip across Canada, travelling from Coast, to Coast, to Coast; Capturing Google Street View of Campgrounds all along the way! This is your chance to participate in this unique opportunity to have your campground mapped out and shown off to the word! We only capture the areas that you tell us are appropriate for capture. You have full control of the areas we go with our cameras to only show the most important features on Google Maps! All faces and licence plates are blurred out to protect your guest's privacy. When potential guests have the chance to explore a virtual tour, they are more likely to book. Not only does it filter out the guests who will not enjoy their stay, it sets them at ease knowing exactly what to expect when booking. Happier customers are great for your reputation. We can only capture a limited number of campgrounds in each area, and expect our calendar to fill up quickly Sign up early to ensure your place! "Kyle is super easy to work with, supportive, visionary and reasonably priced! Very happy with my virtual tour...and it was the best decision for my business, considering we had moved locations and people appreciated 'virtually visiting' before actually visiting. Highly recommend!"